For the priced it was fabulous! These scoops are very durable and great sizes. They work for all needs such as cookies, biscuits, melon balls, etc. Makes dropping cookie balls so easy. I would definitely recommend this purchase to anyone. I bought this product to use making cookies. I have been looking for a good set for awhile. I was surprised with the quality of these scoops, and the eas to use them. They were exactly what I was looking for. Check sizes before you buy. 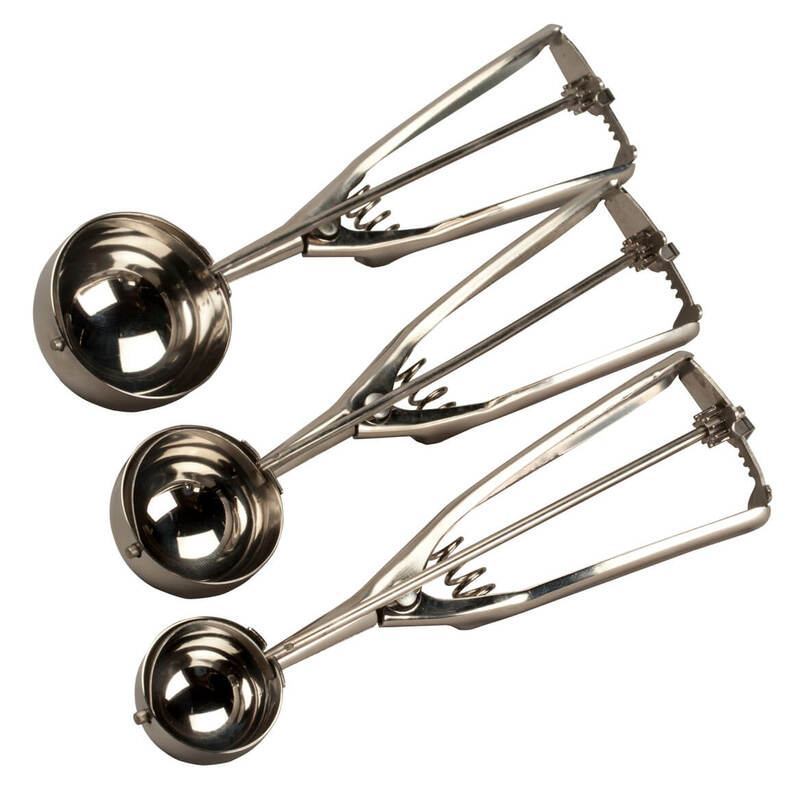 I bought these as a gift, The scoops are huge, I read them as teaspoons/tablespoons not diameter. That was my fault and not a reflection on the product. I bought these for a gift. I make a lot of cookies and I like to make some kinds in certain sizes. These work! I recently received the cookie scoops. In addition to using it to scoop cookie dough, I have used the smallest of the 3 scoops to make ice cream cones. They great and are so easy to clean. I would definitely buy these again if needed or for a gift. 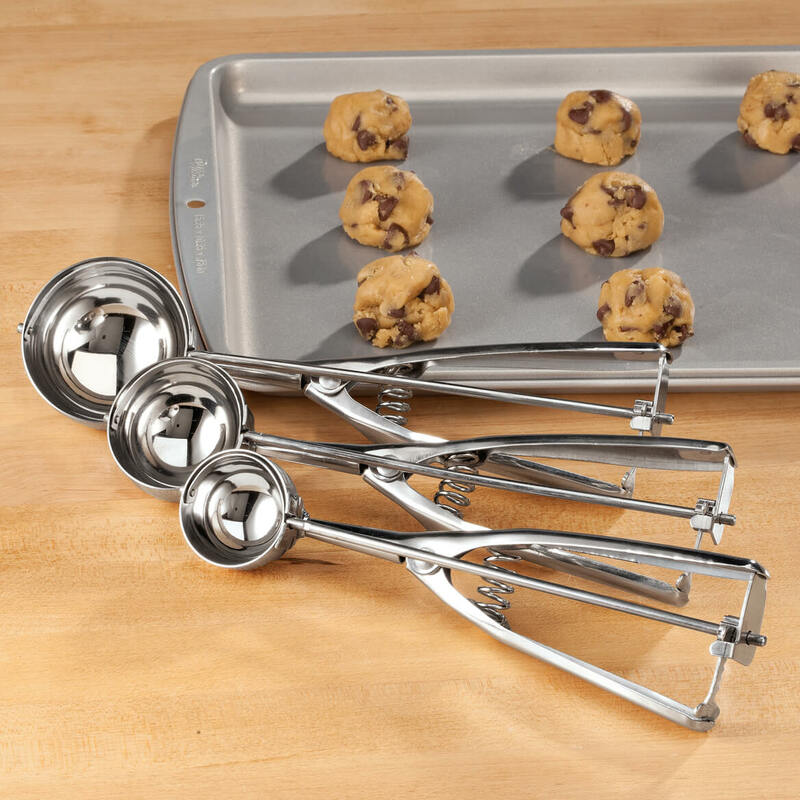 Great cookie scoops, but not sturdy enough to use for ice cream. The interior of the handle is very rough to the touch. I have not used this product yet, but plan on doing so in the near future. I hope it performs like the info states. Love to bake and can use these for just about anything. I normally use two spoons to eyeball and measure cookies onto cookie sheets when baking but they often end up becoming a variety of sizes when in the oven. Hopefully the scoops will help keep the cookies the same size. I'm hoping the scoops will help with meatballs, too. My sister-in-law loves hers, so I decided to get one too. I ordered the scoops for back up incase one of mine breaks. I use mine all the time for cookies and don't want to be without. Also the price is very reasonable for a set of three. My 10 year old Granddaughter is into baking and mentioned she would like one. After pricing them at a dept store... dollar for dollar, I'm getting all 3 here and at the store it would have only been 2 for the same price. I needed 3 different size scoops. Liked the set of different sizes. Need when baking Christmas cookies. I have one of these and love it. I wanted to have more options for the size of the cookies I bake. I wanted a variety of sizes and according to the reviews these are good quality, so I decided to order them. These will make my cookies the same size.......faster too ! They are a present for my daughter's birthday. I have only one size and love to use it to make cookies. A choice of three sizes is GREAT!! I want to make cookie size consistent. So it's easier to get all cookies the same size. i love to make cookies and fell in love with these.different sizes and makes dishing out cookie batter makes its so much easier. first I don't have set of these. I bought because I need to make cookies with different sizes. I make alot of cookies! They would make cookie baking easier and all the cookies would be the same size. My daughter owns her own cookie company. I bake cookies two or three times a week and using the cookie scoops ensures every batch of cookies is uniform in size. picked for uniformity when making cookies, meatballs, etc. Great item for scooping just the right size for my cookies! To get a more consistent size when making cookies. These scoops are great for making cookies the same size and filling muffin tins, especially the very small ones! I love to bake. I choose the three scoops to make uniformed size cookies, muffins, and treats so they will bake evenly. The perfect way to measure the batter evenly. I have been looking for these for a while. I am in charge of the bake sale for our senior center and do most of the baking. BEST ANSWER: I have put mine in the dishwasher on the top rack and they have come out clean & fine. Make sure the scoop side is down so all the water drains out, thus it dries well. I have had no trouble with putting them in the dishwasher at all. I would say they were dishwasher safe. Keep working just fine. Yes. I haven't had any problems.